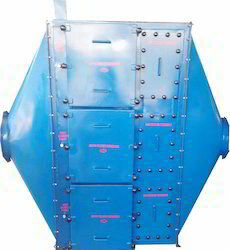 Prominent & Leading Manufacturer from Pune, we offer hepa filter with housing. HEPA is an acronym which stands for High-Efficiency Particulate Air. HEPA Filter With Housing provides a very high level of filtration efficiency for the smallest as well as the largest particulate contaminants. A HEPA filter must capture a minimum of 99.97% of contaminants at 0.3 microns in size. The HEPA filters supplied by us come assembled in custom built housings which ensure a very high degree of the seal between clean and dirty air sides. The housings are provided with ports of DOP injection, scanning windows, Bag-in-Bag-out (BIBO) arrangement for safe change of filter cartridges handling hazardous dust like pharmaceutical dust and others.